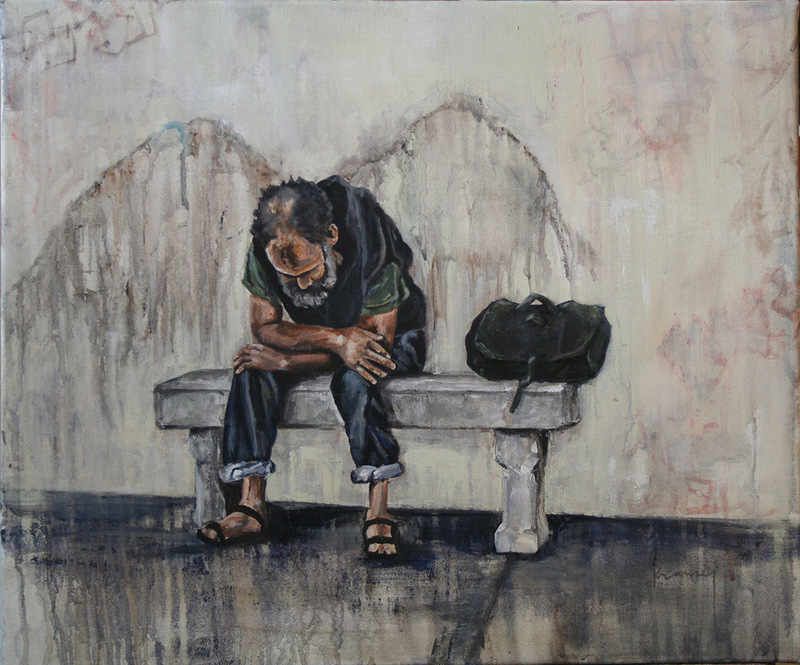 Inspired by the emotional photography of Newnan, Georgia artist Louis Guisto, and the ancient text that I paraphrase as : ” show kindness to strangers, for you may have the privilege to entertain angels unawares” – this painting was created with acrylic paints and inks on canvas. I’m am haunted by a time 25 years ago that I did not help an elderly, homeless man buy groceries. I did change my mind in a matter of seconds, but when I turned to tell him please let me buy your ….. he was gone. He should have been right behind me just a few steps. I searched up and down, but never found him or ever saw him again. This painting is messy and drippy, definitely not what you’d call pretty. If it evokes an emotion in you, then I have created a successful piece. This painting is framed in a simple, worn, black, wooden frame and is wired in the back for hanging.